The Deacon with the brogue is back!! 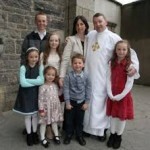 Deacon Fergal O’Neill from Naas, Ireland is our honored and dear friend – but also our guest as we explore two things. First – what it has been like to be a deacon for six months. And then, both deacons, Tom and Fergal share some experiences from Baptisms done during the early days of being a deacon. And we explore a bit of the theology and practicum of working with parents and godparents. Join us for a shorter-than-normal podcast, but one that we think you’ll enjoy. Blessings. This entry was posted in Podcasts and tagged Clergy, Deacon, Vitamin B. Bookmark the permalink.